Care for a bowl of cheddar and fractal soup? No thanks? Just what is that strange, dinosaur-like item below? That my friends is a Romanesco broccoli. A gift from Jenny & Rink of Shooting Star Farm. Something between a standard broccoli and a cauliflower in flavor. The structure is described as fractal because it is built up of one shape that repeats over and over no matter the size. In this case it is self-similarity in spiral pyramid form. Like nature’s matryoshka doll I suppose. What could be more perfect to highlight my first taste of this vegetable than in a warm bowl of cheddar soup? I consulted my trusty American Cookery book for a basic Cheddar soup recipe. With a couple of changes and additions, I came up with something quite delightful. I used shallots instead of onions and I substituted the chicken broth with miso paste diluted in water. 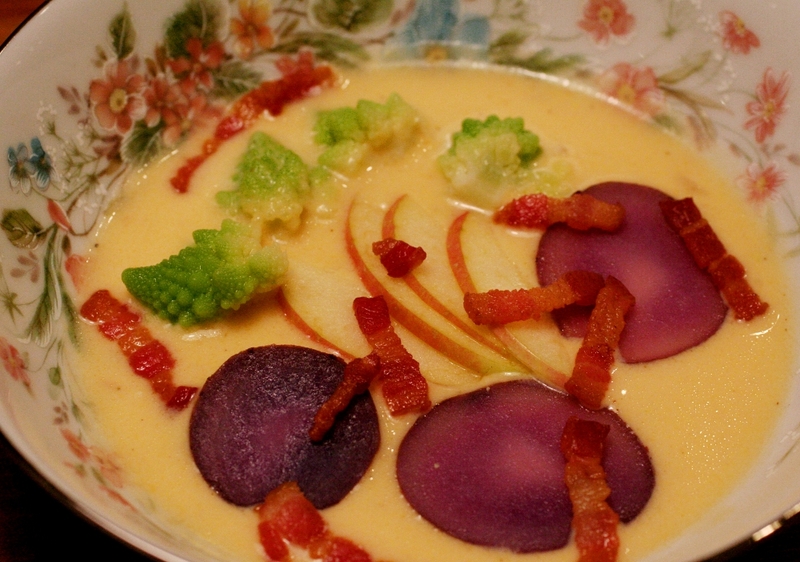 Before serving, I topped the soup with sliced Jonagold apples, purple potatoes, broccoli, and bacon of course! 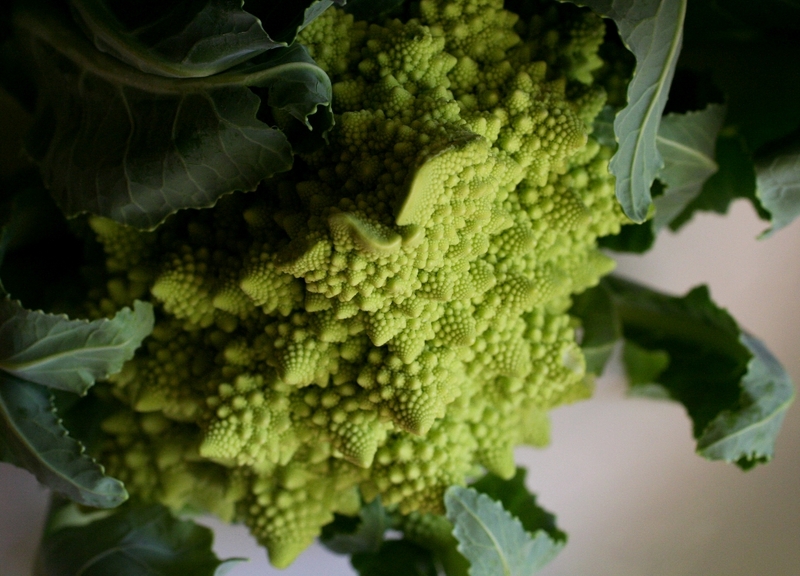 Boil the Romanesco broccoli in some salted water for 2-3 minutes then place it in an ice bath. Boil the potatoes in the same water then fry the bacon. Mash the yellow potato and set aside. It will be use to thicken the soup. The apples and purple potatoes can be sliced right before serving. Gently sweat the onions with the butter in a saucepan until soft. Add the garlic and cook. The mashed yellow potato goes in along with the miso, water, and milk. Simmer for 5 minutes then add the cheese. Stir until everything is melted. Add 1/2 c. of the chopped Romanesco broccoli and turn the stove off. Add the toppings in the serving bowl and enjoy. If you want to make the meal extra special, start or end it with a shot of Yahara Bay Honeycrisp apple brandy. I’m very proud to say that this meal is as local, as regional, and perhaps as good as it can possibly get. 🙂 Cheers! By the way, Driftless Appetite is now on twitter. Please follow us if you are a twitterette! Many thanks. Shopping for Thanksgiving? Think Local.